The sun provides ample energy every day. It’s up to us to figure out how to harvest that energy and put it into use. Our new solar oven can bake two loaves of bread per day, it can cook beans and rice, boil soups and cook them for hours, and warm up leftovers. Solar ovens are a pretty magical way to harvest the sun’s energy and help save on gas, electricity, and firewood. The Olla Solar (Solar Pot) arrived last week, shipped from a company in Monterrey, Mexico. If you read Spanish, you can get more information about them on their website. The idea is pretty genius: an foldable aluminum reflector holds a sturdy glass pot. Inside the pot is a black metal bowl where you put bread dough, pre-soaked beans and rice, meat, or soup ingredients. Cover the pot, and aim the reflector at the sun - in 2-4 hours you have cooked a meal or loaf of bread! The black bowl absorbs a lot of heat, and the glass pot traps it, serving as a small oven. The glass doesn’t get very hot; a careful cook can actually handle the glass after the food is done. The black bowl gets very hot - over 135 degrees centigrade (275 F). The reflector is a bit flimsy but serves its purpose. We’re very happy with this product and may order another one. Our friends in the nearby villages keep asking us how much it costs, so we may attempt to do a bulk order and resell to the nearby towns. This area has lots of sunlight for about 75% of the year. With solar ovens in action in the nearby towns, the whole region could potentially save lots of money on propane costs, with the added benefit of helping save the planet! For those who live in Mexico and have a yard or place to set up this cooker, we recommend you order one. Below we are cooking carrot bread. We have also cooked a wheat flour bread (I was curious if the heat would be enough to do a yeast bread - yup! ), beans, and will be heating up some leftovers for lunch today. 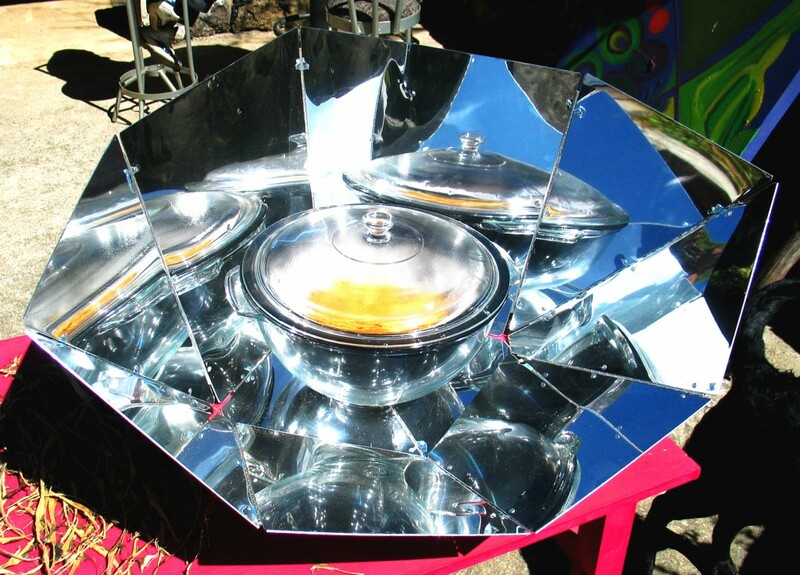 Our old solar oven was based on a design by Maria Telkes - read about her solar cooker in this great article. It was constructed in a prototype fashion, and left out in the rain, and as we took it to town to have a metal worker look at it the whole thing fell apart. We will build a new one in order to have as many solar oven designs as possible. You never know what to expect at the Bosque. Depending on the crowd, activities range quite a bit, both in quantity and type. People engage with each other to develop fun, deepness, and community by leading and participating in a wide variety of activities. Amazing people visit the Bosque and contribute to the vibe. 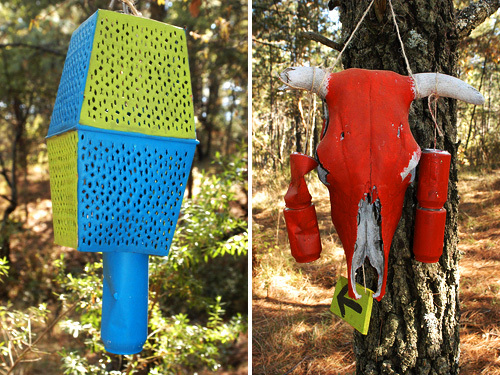 Their creativity, inventiveness and skills are truly astounding. 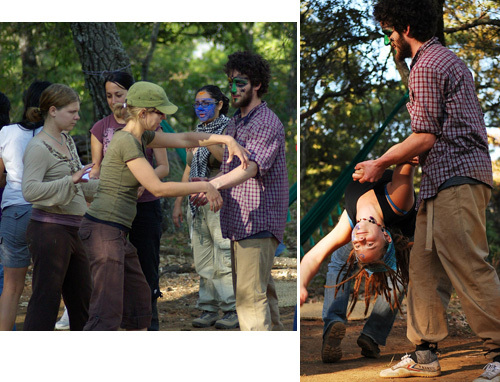 Two guiding principles at the Bosque are Participation and Immediacy as we create a more permanent “temporary autonomous zone”. Our community is committed to a radically participatory ethic. We believe that transformative change, whether in the individual or in society, can occur only through the medium of deeply personal participation. We achieve being through doing. Everyone is invited to work. Everyone is invited to play. We make the world real through actions that open the heart. Immediate experience is, in many ways, the most important touchstone of value in our culture. We seek to overcome barriers that stand between us and a recognition of our inner selves, the reality of those around us, participation in society, and contact with a natural world exceeding human powers. No idea can substitute for this experience. Lucas led a self-defense class. He has spent a year studying Shaolin Gongfu in China and was happy to experience teaching some of what he learned. 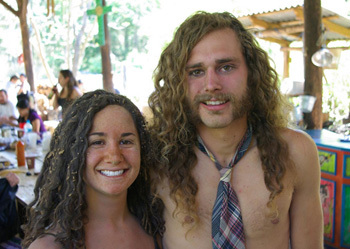 Stephen and Marta created a 9-hole disc golf course. It’s very amazing and very fun! 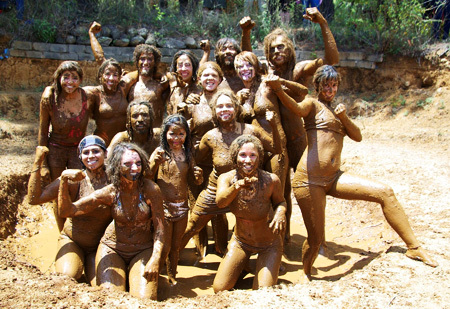 Stephen and Marta also organized a huge mud wrestling tournament. 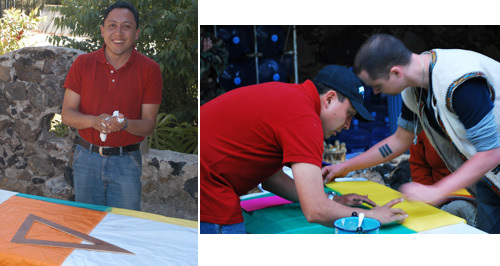 César came to the Bosque with materials to assemble a hot air balloon! He taught others the technique while he made the balloon. 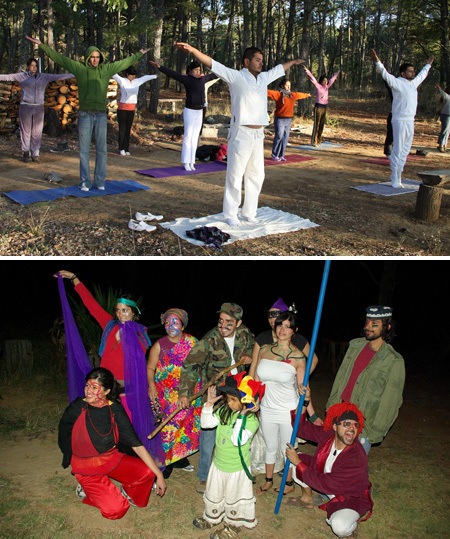 Javiero led yoga and meditation before breakfast, and also organized a theater performance. 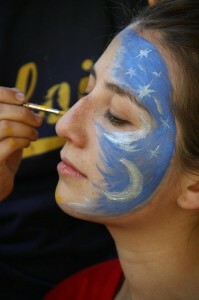 Stella, an artist, painted faces (and fingernails) of nearly every visitor she could find. Kali taught dance workshops - very popular! Raúl led a mini-workshop in permaculture. 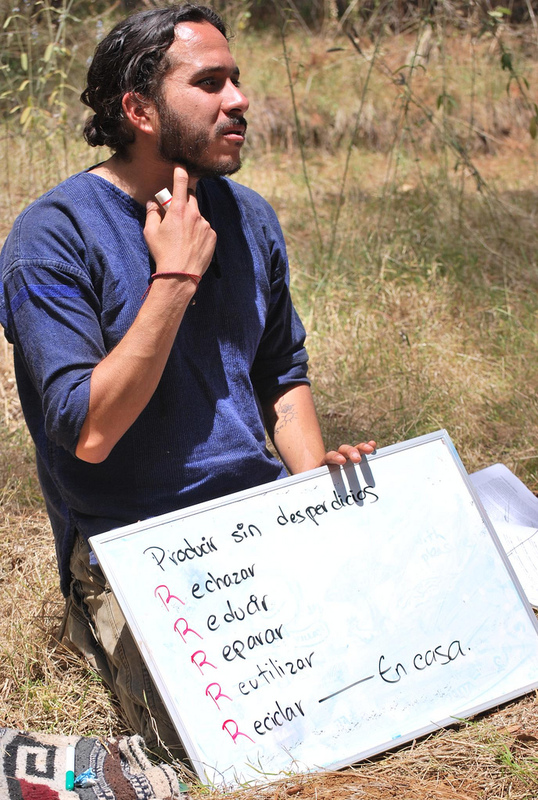 Raúl teaches permaculture and natural building in Querétaro with Ruta Ahimsa. A big thanks to all of our visitors who both participated in and led activities! You are currently browsing the News and thoughts from the Bosque Village weblog archives for April, 2010. Entries (RSS) and Comments (RSS). 18 queries. 0.124 seconds.